Red Lobsters makes a flavorful, and not too spicy, cajun seasoning. This goes well on top of shrimp, chicken, fish, or sprinkled on top of baked potatoes or even corn on the cob. This spice mix can be best described as something between Old Bay Seasoning, and Tony Casares seasoning. If you haven’t had the pleasure of trying out a cajun seasoning mix yet, this one is perfect. Make the spicy Red Lobster Cajun Spice Mix at home. Mix all ingredients together and store in an airtight container. This is better if you can blend with a mortar and pestle or in a spice blender. Red Lobster sells the sea food seasoning that they use for this dish, bought some today at WaMart, yummy! This looks great! Nice combination. 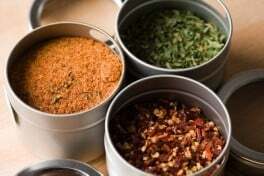 I would love to see a tutorial on how to replicate a commercial spice mix such as McCormick’s Perfect Pinch Vegetable. I make most of my own prepackaged mixes already, I have the best recipe for Taco Seasoning and it cost about 1/4 the cost of mix at the store. I have not been able to find a recipe but am unsure how to replicate this mix. Ever since I had a baked potato at “Redm Lobster” I have bee trying to find the recipe. If you ever find this recipe I would appreciate receiving it. You are right, I meant to say it was flavorful, and not too spicy. Did you mean to say “Red Lobsters makes a [[[not]]] flavorful and not too spicy cajun seasoning” ? ?